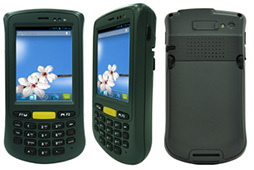 The C350 Handheld computer now with a 2D barcode module allows users start using more modern 2D barcodes, allowing faster barcode reading even on poorly printed labels. 2D barcode module is also a fully omnidirectional scanner, eliminating the need to align the imager to the same orientation as the barcode, and providing a quicker and more efficient tool. Depending on the application, the C350 equipped with a 1D laser scanner is also a reliable and cost effective scanning alternative for reading linear (1D) or traditional black and white barcodes. The C350M2 model is the second generation of the C350 platform, a 1GHz dual-core Cortex A9 processor. Users now get 4GB of storage via micro SD card (and optionally up to 32GB). The built-in WiFi has been upgraded to 802.11 a/b/g/n for maximum wireless communication. Most importantly, the new C350M2 is based on Android 4.1 ("Jelly Bean"), which offers full dual-core support as well as numerous technical improvements. If the user requires a Windows based device, Winmate offers the C350T, which comes equipped with a TI Cortex A8 processor running Windows CE 6.0. Depending on the users’ demands, this device may be ordered with the same hardware features as the Android based model featuring an optional Barcode reader and camera combo or optional RFID reader.